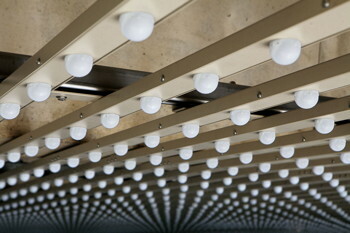 The Leo Villareal light installation at the Johnson Museum. The newest work of public art on Cornell's campus is giving viewers a constantly changing, unique experience. Leo Villareal's "Cosmos" is composed of nearly 12,000 energy-efficient light-emitting diodes (LEDs) on gridwork above the Johnson Museum of Art's Mallin Sculpture Court. 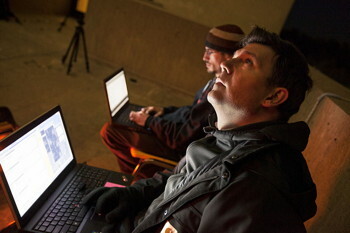 The artist and his team programmed the piece during a campus residency in October. "It's very abstract and very open-ended," Villareal says of the installation, which also is visible in daylight. "Once you begin programming, it changes and becomes something else." Villareal, project architect Walter Smith, and Lisa and Richard Baker '88, who funded the project, visited the I.M. Pei-designed museum in November 2010 to work with museum staff to determine a location for the installation. The sculpture court ceiling, measuring approximately 45 feet by 68 feet, was chosen for its high visibility on campus and from the city of Ithaca below. Working with Andrea Inselmann, the museum's curator of modern and contemporary art, the artist's team returned in April 2012 to install a 9-foot-square mockup, and installation of the final work began in August. The grid is attached to the ceiling through electrical junction boxes. Villareal says the installation also "reinvigorates the site. This building was really radical in 1973, and it still is." "From the very beginning, it's been the most collaborative and exciting project I think I might ever have worked on," says Stephanie Wiles, the museum's Richard J. Schwartz Director. "We all believed in the project and are excited to have it at the Johnson for so many different reasons, including inspiring students who are working with digital technology." Villareal said he named the piece "Cosmos" because "I grew up on Carl Sagan and love that he spent so much time here. I was a geeky kid with an Apple II+." Software, programmed by Villareal and project team member Jason Cipriani, will generate new patterns throughout the life of the installation. Villareal's major site-specific works include "Multiverse" in the National Gallery of Art's Concourse in Washington, D.C., in 2008, and "Hive," recently installed in the Bleecker Street/Lafayette Street subway station in lower Manhattan. Another new piece, "Buckyball," opened in October in Manhattan's Madison Square Park. The artist said his work on "Cosmos" has also helped with his largest installation to date, "The Bay Lights," which opens in March 2013 and will stretch 1.8 miles on the San Francisco Bay Bridge. Richard and Lisa Baker have commissioned works by artists including Villareal and James Turrell, and have worked with Smith on several installations. To support established and emerging artists, the couple created the Baker International Exhibitions foundation, overseen by Lisa Baker, who also serves on the Johnson Museum's Advisory Council.